Krista specializes in shaping, tailoring, artistically and skillfully designing haircuts with Sahag haircutting techniques. Since joining the Studio Luxe Salon team in 2009, Krista has attended extensive training in NYC and has become an educator in Sahag Dry cutting techniques. Being the salon's team leader, she work hands on with every stylist on a daily basis to ensure their continued knowledge in Sahag Dry cutting. She strives to inspire with current styles and delivers superior quality to every guest. Krista has been certified in Ouidad Curly haircutting techniques since 2010 and has a passion for helping those with curly hair. She shapes and blends curly in soft bouncy styles, eliminating the dreaded pyramid effect curly hair can take on. "I love transforming curls so my clients look and feel beautiful and confident in their curly hair. It is such a good feeling to take hair that is prone to frizz and dryness and make it soft, touchable and bring it to life again!" Krista believes healthy, beautiful hair can change a persons life. Working with hair that is thick, straight, fine, or curly, Krista has the knowledge and experience to take on any challenge. 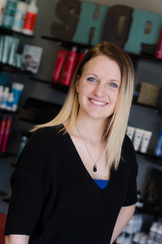 She is proud to offer her clients solutions from color corrections, to easy maintenance you can rely on Krista to provide unmatched customer service and education and tools for you to duplicate salon quality at home! Krista has such a passion for her work that she regularly travels to share her knowledge with junior stylists. Representing Sahag, she travels to NYC and teaches both in state and out of state at trade shows, demonstrating Sahag techniques. Amanda Skinner is an innovative hair designer and platform artist, with more than 19 years of experience in dry haircutting. Amanda has a Master Certification from the John Sahag workshop in New York City and is also holds a certification in Ouidad Curly haircutting. A master at her craft, Amanda has been specializing in John Sahag shaping techniques since she began her career. “It’s a great experience to be able to offer something extraordinary and truly unique to our guests. I'm blessed to have the opportunity to not only offer Sahag techniques in my salon, but also to be an educator and mentor.” says Amanda. John Sahag has been Amanda's inspiration and is passionate about the art dryshaping that can be seen on the current celebrities, and Victoria’s Secret models. Her greatest attributes: PASSION. PERFECTION. INTEGRITY. Studio Luxe came from a vision, to create an atmosphere that focused specifically on hair design; “It was important to me to offer a place that is specializing in hair design, and leave the skin treatments for the day spa.” Amanda works with some of the best hair artists and educators of Team Sahag, Ouidad, and is believes these techniques are elevating the art of haircutting to the highest level. “The purpose of these two techniques is to leave each client feeling and looking beautiful inside and out, leaving their hair soft, and movable. The result: a shape that grows in, not out, high-volume style that requires minimal upkeep between visits”, adds Amanda. Ouidad Certified Curly Hair Specialist. Nufree waxing certified. Xtreme Lash Specialist. Ashley is a Sahag Master Designer and is certified in Ouidad curly haircutting techniques, eyelash extensions and nufree waxing. She is passionate about the unique art of dry haircutting. She goes above and beyond haircutting services, artfully creating a shape into the hair. She enjoys providing a service that actually focuses on the design of hair. “Sahag gives me the opportunity as an artist to create a unique look that gives the hair movement and styling ease without the maintenance.” It is her goal for every client to feel wonderful and educate them on how to achieve their best look. Ashley is extremely passionate about curly hair and loves the art of shaping curls- allowing them to puzzle together. Her knowledge in Ouidad styling techniques and product education enables her to form soft, natural, care-free beauty. She is certified in Hotheads Hair Extensions and loves the transformation of long, beautiful hair to her clients wanting more length and volume. Ashley is a Joico color expert and has more than eight years of salon experience, staying current in color trends and Joico color theory, and takes pride in being able to create flawless color that looks soft and natural. Classic Highlighting is her favorite coloring technique. Ashley is your full body waxing specialist, from eyebrows to brazilians. Certified in Nufree, a non-wax hair removal system. Nufree was made for plastic surgeons, so it causes less pain and redness. She is also trained in Xtreme Lashes, semi-permanent eyelash extensions. 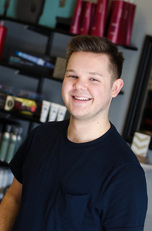 Brandon has an artistic vision and attention to detail that makes for a modern and edgy haircut- individualized for you! He is passionate about the Sahag technique of shaping the hair while its dry. He is current with the latest trends and styles and is excited to learn new techniques and continue his education, always working on innovative ways to push the boundaries. Whether you are looking for a classic cut or something a little more edgy, Brandon will make your hair take shape! Brandon also specializes in specialty color techniques from balayage, highlighting and transforming your look with a precision application. Kelly is a Creative Stylist with 16 years of experience. Kelly specializes in Sahag Dry haircutting. Malori utilizes a wide range of talents in beauty for hair color, cutting and styling to personalize a look for each client that compliments them best. Her approach to hair coloring is to maintain the heath and integrity of her clients hair, while achieving the most beautiful and youthful look! After all, hair influences the way you feel about yourself. "Looking at a canvas of uncut hair and visualizing what can be created, gives light to all the potential beauty your hair already has. I believe there are no limitations with your hair, you can be as creative or as conservative as you want! My passion is within the beauty industry itself, I'm always learning new trends and ways to make your experience one of a kind! ", says Malori. Our staff consists of SAHAG dry haircutting educators; the only local salon where every team member specializes in the art of SAHAG haircutting. Click here to learn more about Sahag Drycutting and Ouidad Curly Techniques . This approach to shaping the hair takes time,rather than 'cutting' the hair takes patience, and concentration. Our craftsman use those skills to give you a low maintenance haircut and enhance your best features! By studying your contours, density and texture of your hair, we work like and understand your hair like an artist. Sahag's technique and approach- Treat every client individually and find the “look”; a signature "cut" as unique as your fingerprint!